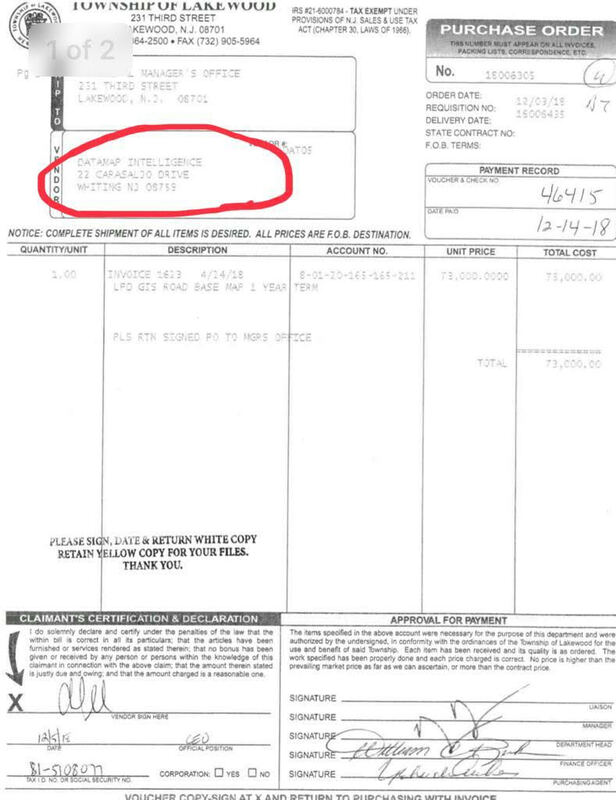 In the invoice below you can see : Shady Schwab asked the township to send his checks to a fake address in Whiting NJ. To me it’s simple: some people are so used to operating in a shady mode to the point that they possibly cannot do it in any other way. It becomes part of their DNA. The Township of Lakewood has been doing business with Mr. Schwab for many years. Don’t they know he resides at 22 Carasaljo Dr. in Lakewood – not in Whiting NJ!?! Well, Of course they do. Thing is, over the years it became the job of the Mayor, staff, township employees, township committeemen…. to serve at the pleasure of Shady Schwab. Whatever whim comes to his mind, they will obey. Looks like an innocent mistake. Did he ever receive his check or was it returned as “no such address”? Or did he just pick it up at the office? So then it didn’t matter what the correct address was.